Funky and fairly easily recognized, Lactarius corrugis associates with oaks in eastern North America. When young, it has a cap that often appears coated with a very thin layer of whitish to grayish felt. At maturity, however, the coating has largely disappeared and the cap surface is often prominently corrugated. The copious white milk stains the gills and flesh slowly brown. 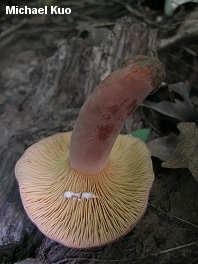 Lactarius corrugis is similar to Lactarius volemus, but has a darker, redder cap, along with a darker stem and darker gills. Ecology: Mycorrhizal with oaks and perhaps with other hardwoods; growing alone, scattered, or gregariously; summer and fall; widely distributed in eastern North America, and extending into Texas and Mexico. 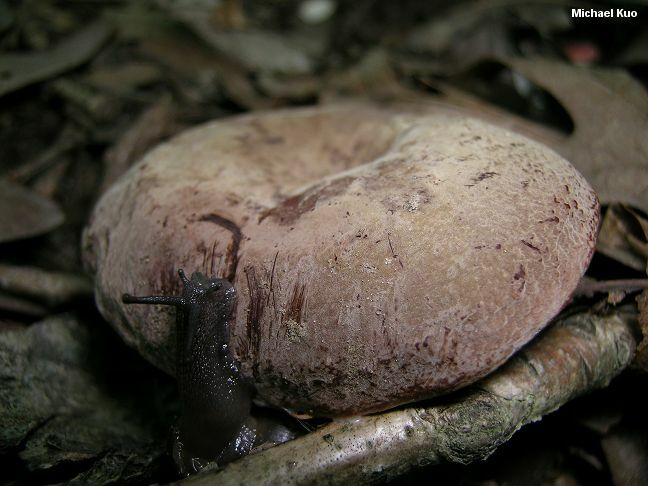 Cap: 4-20 cm; at first convex; becoming shallowly depressed; notably velvety; when young often appearing coated with a thin, grayish to whitish, feltlike material; in maturity often becoming deeply wrinkled and corrugated; usually dark brownish red to dark brick red but sometimes purplish brown or dark brown. 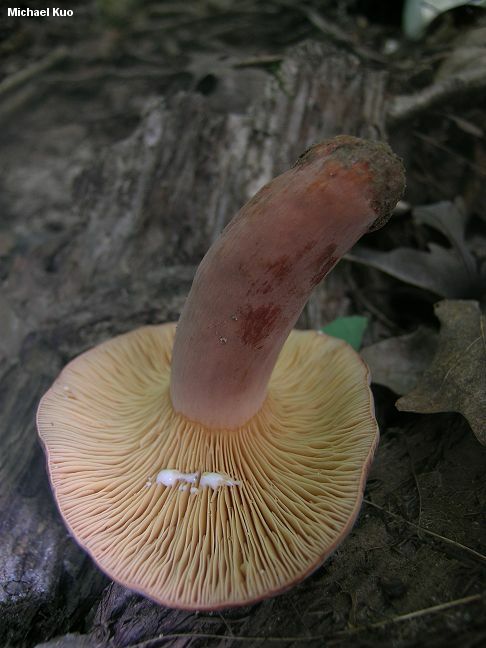 Gills: Attached to the stem or beginning to run down it; close; pale buff when young but soon orangish to yellowish or brownish; discoloring brown where injured. 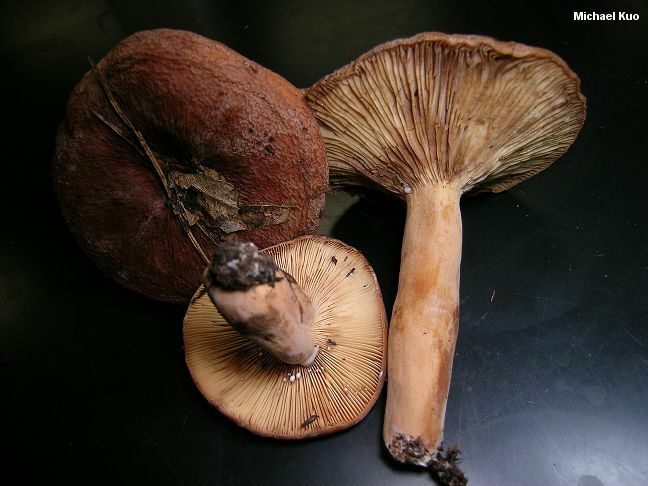 Stem: 3-11 cm long; 1.5-3 cm thick; colored more or less like the cap, or paler; equal; when young with a feltlike coating like that on the cap; solid. Flesh: Whitish to yellowish; staining slowly brown when sliced. Milk: White; copious; unchanging when exposed to air; staining tissues brown; staining white paper brown. Odor and Taste: Odor not distinctive, or sometimes slightly fishy; taste mild. Chemical Reactions: KOH olive to brown on cap surface. 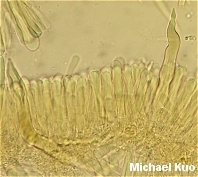 Microscopic Features: Spores 9-13 x 8.5-12 µ; globose or subglobose; ornamentation 0.4-0.7 µ high, as widely spaced amyloid ridges forming partial to completed reticula. 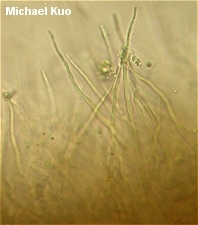 Pleuromacrocystidia conspicuous and abundant; subcylindric to subfusiform; thick-walled; arising in the subhymenium or gill trama; to 200 x 15 µ. Cheilocystidia similar but shorter. Pileipellis a lamprotrichoderm with a turf of cylindric to narrowly fusiform pileocystidia measuring up to about 125 x 6 µ.
REFERENCES: Peck, 1880. (Saccardo, 1887; Coker, 1918; Kauffman, 1918; Hesler & Smith, 1979; Smith, Smith & Weber, 1979; Weber & Smith, 1985; Phillips, 1991/2005; Lincoff, 1992; Metzler & Metzler, 1992; Montoya & Bandala, 1996b; Barron, 1999; Roody, 2003; McNeil, 2006; Miller & Miller, 2006; Binion et al., 2008.) Herb. Kuo 08270210, 07210802.